Ian Baird’s Spitfires were made to rue missed opportunities at the Silverlake Stadium as visitors Bishops Stortford claimed all three points. The game was settled by three goals in the space of five frantic second-half minutes, as Stortford opened the scoring only to be pegged back by an instant reply. Eastleigh were on level terms through Brett Williams excellent headed equaliser for just two minutes as Ross Prestedge added to Duane Jackman’s goal to restore the Bishops’ lead; one which they managed to hold on to despite a number of chances going astray for the hosts. The conditions were very wet and rainy to begin with but the sun had come out in the second half. Once again the pitch looked in fantastic shape and all credit and compliments must go to the ground staff. Before the game their was a minutes applause in memory of the late Markus Liebherr (Southampton FC Saviour) who tragically passed away earlier this week at the age of 62. The tribute was also in honour of former Exeter City striker Adam Stansfield and Eastleigh’s Colin Pigford. Eastleigh handed summer signings Will Hendry (who arrived at the club just this Friday, formerly of Hayes & Yeading and AFC Wimbledon), Chris Holland, Jamie Slabber and Richard Graham their full debuts for this season opener. Matthews was preferred to Gareth Barfoot in goal, whilst Warren Goodhind was again left to fill the left back void owing to Brett Poate’s injury. Utility man Ross Bottomley played at right back with captain Tom Jordan and Chris Holland completing the back four. Staforde Palmer lined up on the wide right of a midfield consisting of Danny Smith and Will Hendry in the centre and Richard Graham on the left flank. Up top, Jamie Slabber partnered last season’s Player of the Year and top goalscorer Richard Gillespie. Eastleigh came out of the starting blocks well making a very positive opening to the game. Immediately Palmer became a threat with pace and skill down the right as he forced an unconvincing punch from one-time Eastleigh goalkeeper Nicky Morgan inside the opening minute. The towering keeper looked shaky throughout the afternoon and never looked comfortable at dealing with high balls and crosses into the Bishops Stortford area. With just two minutes on the clock, Eastleigh fans were given an immediate sense of what they can expect to see more of from their new creative, attacking midfielder Will Hendry. The 23-year-old came close with a whistling, low left-footed strike from outside the area that had to be tipped around the post for a corner kick. Eastleigh continued to ask all the questions with Palmer forcing another corner for the Spitfires early in the game. In the 12th minute, Hendry picked out Gillespie with a perfect, precision pass in behind the Bishops Stortford defence. The ex-Bashley striker did well to get into a shooting position, only to be held off by his marker who prevented a goal-scoring opportunity with strong defending. Six minutes later, Richard Graham played the ball into the feet of Will Hendry who unleashed another trademark drive from 25 yards where he was denied by the inside of the post. A fine attempt by the midfielder and desperately unlucky not to have opened the scoring. Soon after, Staforde Palmer weaved his way into the penalty area cutting in from the right and had a searching cross half-cleared by the big fists of Morgan in the Stortford goal. It wasn’t until the 19th minute that the visitors managed their first attempt on goal. Matt Judge picked out Duane Jackman in the centre but the striker’s header was comfortably over the bar and was never in danger of testing Jason Matthews. Tom Jordan deflected a Max Lette Jallow effort through to Matthews as the Eastleigh skipper pressured his opponent with a timely block to take the sting off the shot; Mark Simpson’s side were slowly beginning to grow in confidence. The best chance of the half fell to Eastleigh’s Jamie Slabber in the 22nd minute when Richard Graham’s pinpoint cross from the left was crying out to be put away from close range. Slabber looked certain to score and would have been disappointed with the outcome of nodding the ball wide from just six yards out as the gilt-edged chance quickly came and went. Eastleigh perhaps shaded the rest of the half but by now the referee, Ben Knight of Waterlooville, had lost his way in the game proving to be highly inconsistent with bookings and fouls, much to the increasing frustration of the home crowd. 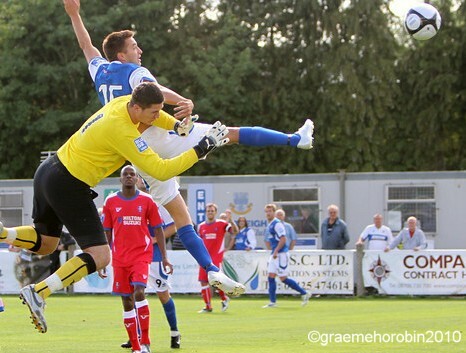 Chris Holland had a header blocked en-route to goal to force consecutive Eastleigh corners midway through the half, before Richard Graham found himself on the end of a promising attacking move from the Spitfires, which saw the ball worked well from right to left with Danny Smith and Staforde Palmer combining. The tricky winger lost his footing and was unable to round off with a goal. Seven minutes before the break, Richard Gillespie had a header saved low down at the near post by Nicky Morgan. Eastleigh played some neat football particularly in the opening twenty minutes or so and should have taken the lead through Slabber after also coming extremely close through Hendry, but it remained goalless at half time. After the break, Richard Gillespie got the better of Aiden Palmer in the 50th minute to find himself one one one with the keeper after seeing off his marker with strength and power to go clear. Having done the hard work, Gillespie’s shot to the left of goal was kept out by the tall frame of goalkeeper Nicky Morgan. Out of the blue, Bishops Stortford took a surprise lead through DUANE JACKMAN who took advantage of a momentary lapse in concentration at the back, to meet a low cross from the left with the simplest of tap-ins. The opening goal sprung the game to life as Eastleigh hit back with an instant reply just after the hour mark. BRETT WILLIAMS’ impact in coming off the bench for Staforde Palmer was immediate. The young striker put Eastleigh back on level terms with a brave header to meet Warren Goodhind’s swept cross, which sat up perfectly in front of goal. Williams rose well to beat Morgan to the ball in the air and powered his header into the back of the net. Disappointingly for Eastleigh, the equalising goal was cancelled out as quickly as it had come. REECE PRESTEDGE fired into the corner of goal to beat Matthews on the volley from 8-yards following a devastating cut-back by Sanchez Ming. The goal restored Bishops Stortford’s lead to complete a frantic five minutes of football where three quick-fire goals were scored. Prestedge’s strike proved to be decisive as the winning goal. Eastleigh in response sent on Jamie Brown in place of Slabber but it was his fellow substitute and goal scorer Brett Williams who again came close. With 68 minutes played, a dangerous Hendry cross saw Williams the first to react in the box, though the AFC Totton loanee’s first time clipped shot was inches wide of the post. Richard Graham had a decent opportunity to test the keeper two minutes later after productive work from Richard Gillespie on the right. As the ball broke through to Graham, the former QPR winger failed to hit the target. Fifteen minutes from time, Williams had a penalty claim turned down following a ball over the top by Jamie Brown. Brett latched on to the pass to out-pace Stevland Angus but just as the striker was in the clear, he was sent tumbling to the turf under a challenge from the Stortford centre back Angus. Referee Ben Knight unsurprisingly (based on prior decisions), decided the defender made contact with the ball. Brett Williams was denied his and Eastleigh’s second equaliser of the game in time added on. Richard Graham’s threaded pass found Williams, who this time had a goal-bound shot deflected agonisingly wide for a corner when well-placed in the middle, as another good chance went begging. Richard Gillespie headed over the bar from a deep Jamie Brown cross in the closing stages of the game but try as Eastleigh might, they were unable to force a draw to claim what would have been a deserved point. Next up for Eastleigh is an away game at Dorchester Town on Tuesday night where Ian Baird’s Spitfires will be looking to take some of the positives from today’s display despite the result, and look to record their first points of the season.